The 95th (Rifle) Regiment of Foot is an Australian based Regiment on Holdfast: Nations at War. Are you the kind of man who can shoot a bird’s eye in the dark with a rifle? Are you more at home in the wilds stalking your prey? Are you the kind of man willing to learn to fight in a cohesive unit, which is versatile in nature in all manner of combat? Yes? Then the 95th (Rifle) Regiment of Foot is the regiment for you! 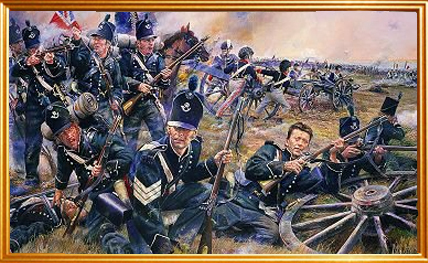 Formerly a Mount & Blade Warband: Napoleonic Wars regiment, the 95th (Rifle) Regiment of Foot (est 26/11/2013), is a specialist skirmisher regiment based in the Oceanic region. We differ from other regiments in that we have a dedicated skirmisher company and intend to play the rifleman/skirmisher class wherever possible. We strive to be the best shots in Oceania with a capable company of supporting infantry while remaining a fun place to play for players of many skill and playstyle varieties. We are looking for mature and enthusiastic players aged 15 years or older (sorry, no drummer boys) to join the ranks! With our different companies to suit different playstyles and our democratic process for appointing leaders, the 95th is the regiment for you! 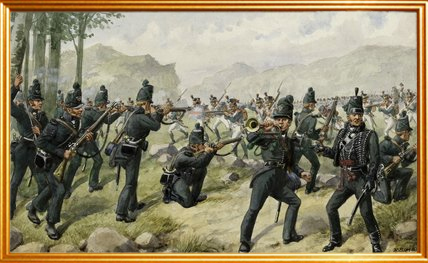 Formed in January 1800 as the "Experimental Corps of Riflemen" to provide sharpshooters, scouts and skirmishers, they were soon renamed the "Rifle Corps". In January 1803 they became an established regular regiment and were titled the 95th Regiment of Foot (Rifles). 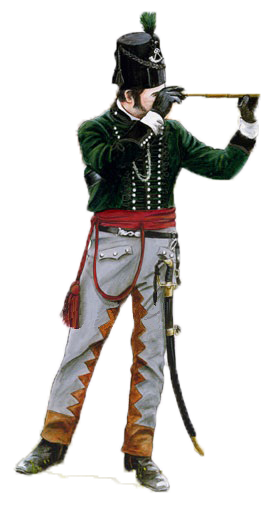 The unit was distinguished by its use of green uniforms as standard in place of the traditional redcoat, as well as being armed with the first British-made rifle accepted by the British Army, in place of smooth-bore muskets — the first regular infantry corps in the British Army to be so. In August 1808 the 2nd/95th was part of the immediate forces sent in the Portuguese expedition initially commanded by Sir Arthur Wellesley and covered the landings at Montego Bay. On 15 August they had the distinction of firing the first shots of the Peninsular War during a skirmish at Óbidos against the French, but also unfortunately suffered the first British officer fatality of the war, a Lieutenant Ralph Bunbury. The 95th, as part of 6th Brigade which included the rifle armed 5th/60th Foot, took part in the Battle of Roliça, the first pitched battle of the war, on 17 August 1808. 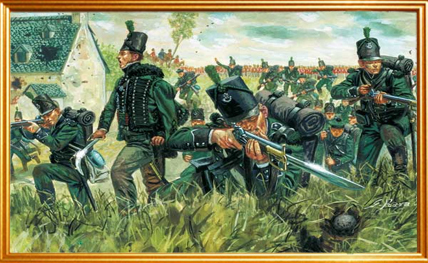 Rifleman Thomas Plunket of the 1st Battalion, 95th Rifles, shot the French General Auguste François-Marie de Colbert-Chabanais at a range of up to 800 yards (730 m) at the Battle of Cacabelos on 3 January 1809. I've never been in a regiment, company or anything like that before in any game. I think this will be a fun and learning experience. I have played a couple hours on Holdfast:Nations At War.